I’ve been working on a script (due to personal interest and requests from various private tracker threads) that auto-moves torrents from Deluge (better at downloading & uploading simultaneously) to rTorrent (better for long-term seeding). Now that it’s completely “out of beta” so-to-speak, I’m going to share it! I hope someone finds this useful. Use your favourite text editor to save the script below somewhere. Make sure you chmod +x delugeExport.sh (or whatever you end up calling it). The script has several dependencies. You need to install/configure them. Download this other script and put it somewhere. I put it in the same directory as delugeExport.sh. In order for this Perl script to function, it requires the Bencode module: sudo perl -MCPAN -e 'install Convert::Bencode'. Finally, don’t forget to chmod +x rtorrent_fast_resume.pl. Configure the configurable things in delugeExport.sh. They’re all important so don’t miss one. 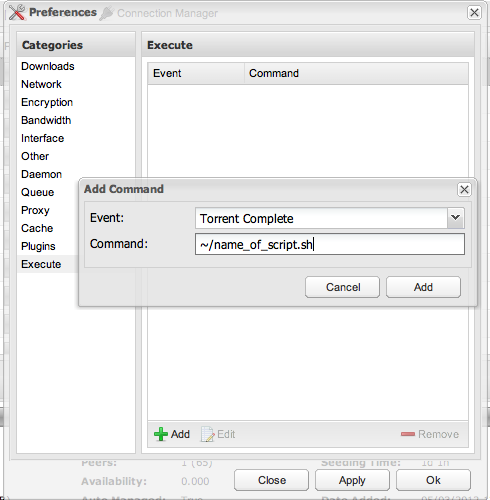 Ensure rTorrent is setup as you would like. You basically just need the watch folder setup (schedule = watch_directory,5,5,load_start=/your/directory/*.torrent). You also need to set rTorrent’s download directory to the directory where Deluge sends completed torrents. Any other stuff like ruTorrent can wait if you want. Now you need to run the script from the command line. Every single *.torrent file that you have loaded in Deluge will be processed by rtorrent_fast_resume.pl and will have fastresume data added to it. This will only happen for 100% complete downloads. Partial, or still-downloading torrents will not be moved across. All your Deluge torrents are now in rTorrent’s watch folder and have been added if rTorrent was running! Go to Deluge and remove (without data) all your completed torrents. Go to Preferences –> Plugins. Turn on Execute. • Restart deluged (and deluged-web). Unfortunately, due to a bug in the Execute plugin (version 1.3.5 and earlier only) concerning Unicode handling, before you start testing out your new configuration you must follow this post of mine here. If not, you’ll find that random torrents stay resting in Deluge, even after they’re completed. Finally, you’re done! Add a torrent to Deluge and test it! Also, you can further minimise your time dealing with Deluge by using this UserScript (use it with NinjaKit for Safari or Chrome). # Do you use http or https to access the WebUI (default http)? # Which folder are you keeping rtorrent_fast_resume.pl in? # Please include trailing slash. # please specify that directory. Please include trailing slash. # rTorrent's watch folder. Please include trailing slash. # just to be sure but probably not afterward). # Backup if you told it to. # to rTorrent's watch directory, $watch, for addition. # $1,$2 received from Execute plugin. Need specifics when not en masse. # If block ensures these lines don't run except via Execute plugin. # Remove torrent using $1 var passed from Execute. perl $dir/rtorrent_fast_resume.pl "$torrentpath" < "$files/$torrentid.torrent" > "$watch/$torrentname.$RANDOM.torrent"
Please leave a comment if you find a bug! And, yes, if you so desire, you can use this script as a simple way to move from Deluge to rTorrent completely. Simply execute the script once from the command line and everything will be moved over, imported into rTorrent via the watch directory. That happens by simply modifying the variables? I can’t imagine how. Can you try again from scratch? Hi, thanks for the script. Will this also remove the torrent and data from Deluge when run? I ran the script successfully, the data and torrents were moved to rtorrent/data and rtorrent/watch, but Deluge appears unchanged. I had “backup=yes” set when I ran the script the first time. Maybe that’s why? Thanks!